After the first disastrous shared-room experience here at home (ended at 3 am with Mommy practically in tears and Ellie back in her own room), last night the girls shared their room very successfully. We'll continue on this path (with E's old bed at the ready - to avoid crazy-mommy-syndrome) and hopefully we'll get all the kinks ironed out soon. I'm really excited to have a guest room back (although E's back-up-bed and Anne Marie's big-girl (read: choking hazard) toys are going to still take up most of the space. 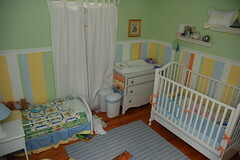 Perhaps we'll go ahead and put away the crib and just set up a pack-n-play to save space. We'll (slowly) get it all figured out.